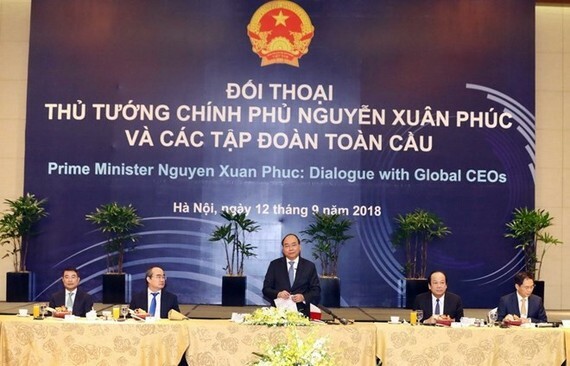 Prime Minister Nguyen Xuan Phuc hosted a dialogue on September 12 with arout 20 leaders of multinational corporations who are in Vietnam to attend the 2018 World Economic Forum on ASEAN (WEF ASEAN). Judy Hsu, CEO ASEAN and South Asia, Standard Chartered Bank, said the bank, which has operated in Vietnam for 115 years, pledged to continue to promote stronger cooperation in the country. At the same time, representatives from Thai Beverage (Thaibev) of Thailand said the group invested about 5 billion USD in Sai Gon Beer, Alcohol and Beverage Corporation (Sabeco) of Vietnam, and expressed the belief in Vietnam’s strong economic growth prospect. The group pledged to promote Sabeco brand name to the world.